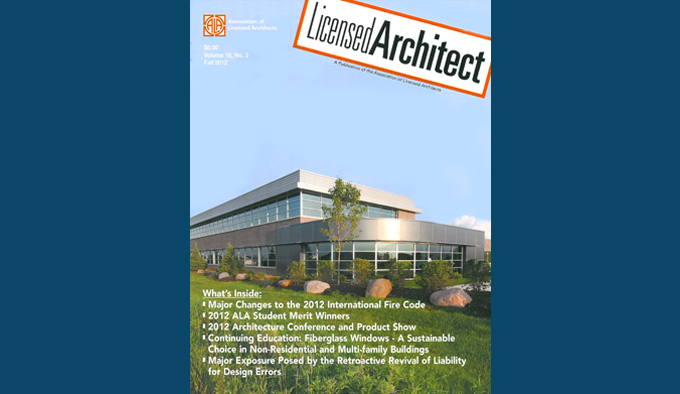 Partners in Design Architects featured in Licensed Architect magazine. Riley Construction Company's new LEED Silver certified headquarters in Kenosha. The Kenosha Area Business Alliance's (KABA) renovation of a historic downtown Kenosha commercial building, with Jockey's hometown Factory Store as its ground floor retail tenant, and offices for KABA and the United Way above. Oglesby Professional Office Center, a multi-tenant office building in Gurnee, Illinois. Market Square, a mixed use urban renewal project in Zion, Illinois featuring a hotel, banquet facilities and ground floor retail space. RecPlex, a 300,000 square foot community recreation center in Pleasant Prairie, Wisconsin. Pike Creek Horticulture Center, a new home for the Gateway Technical College Horticulture Program in Kenosha, Wisconsin.